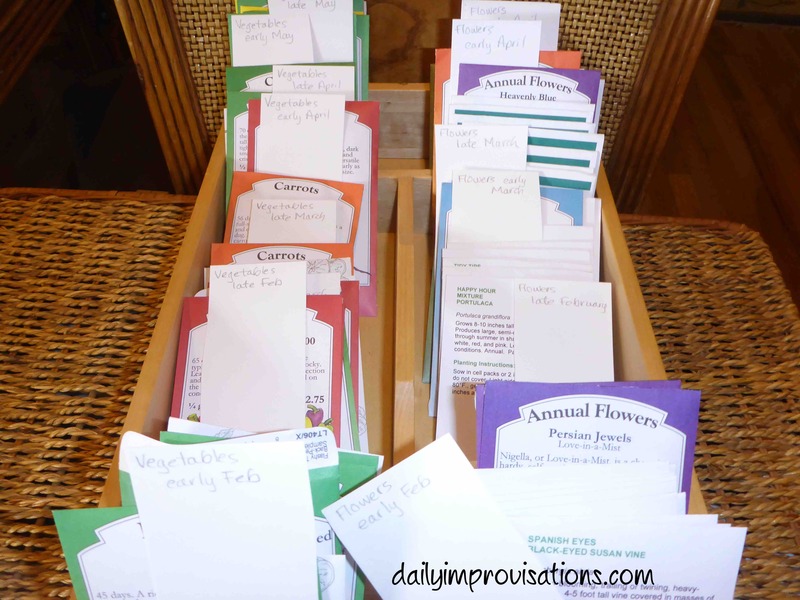 All you need is some sort of box or container that will hold the seed packets you want to use this year, a few index cards, and a writing implement. My index cards were larger than the seed packets, so I cut them in half lengthwise. This would make better use of space inside my box. Here is the box I will use for my planting calendar, inside the large basket I keep all of my seeds in. When I am done, the alphabetized seeds will be underneath in another container and this box will be on top. The jars are seeds I have saved myself, and there will be some room for them in the box if I decide to use any of those varieties. 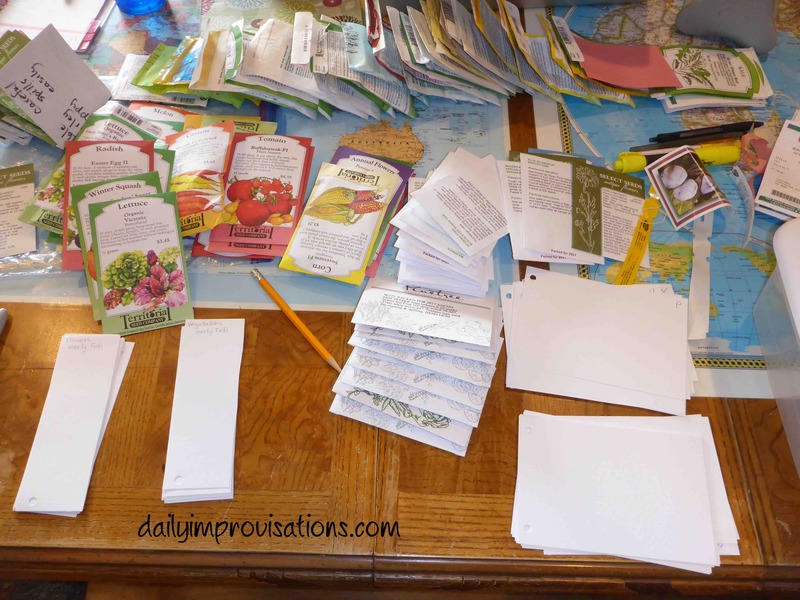 Then, I sorted my seed packets according to when they should be planted. If any of the seeds are to be planted in succession, such as lettuce all spring long, I can just move the packets back into the next category. The sorting had to start by making piles on the table! I decided that it didn’t matter whether the seeds were going to be planted directly outside or in the greenhouse. 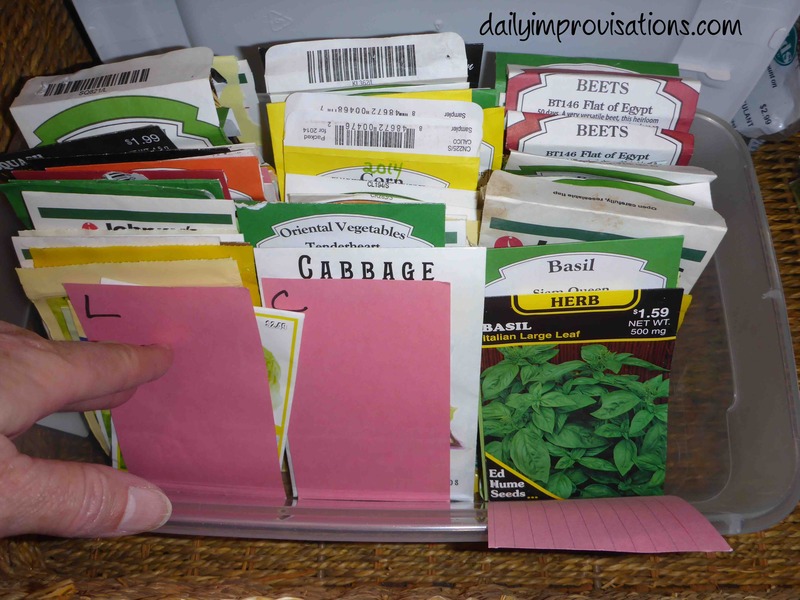 I know well enough what can be planted outside, and if you don’t, you can highlight important information on the seed packet, or make notes. 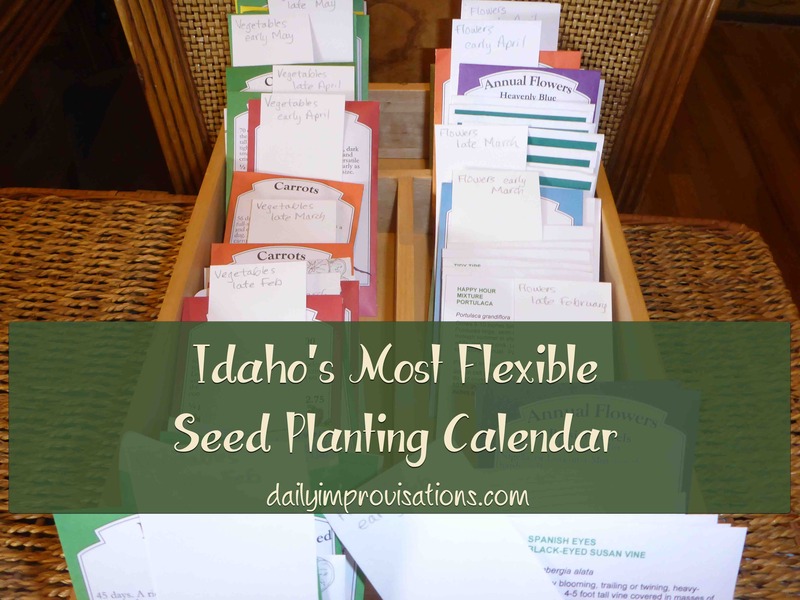 Here is a clear view of the flexible, seed packet planting calendar or schedule. Note that not all seeds are quite as tender as the seed packets might have you believe. One way to get a feel for this is to note what is volunteering in your garden throughout spring. Sunflowers start sprouting quite a bit before the last frost, but beans or squash always wait until the ground is very warm. I opted not to move seed packets forward if I missed the best planting time. This would make it more clear that something might need to be planted as soon as possible. 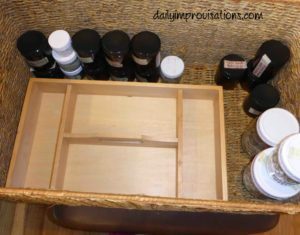 The seeds that I am saving, but not planning on using this year, have been relocated to a couple of plastic containers for now. I will need to get something a little bigger. I already mentioned a couple of ways to decide if I will relocate a seed packet to another time category. However, if I am done with a seed packet for this year, I need to do something else with it. I could immediately file it back into my alphabetized seed storage, if it was handy. It usually isn’t for me, since I don’t want my seeds kept in my humid and warm greenhouse. So, I have a separate basket to lay them in, like a file for work completed. Then, I can put them back into storage later. Don’t rush to throw empty an seed packet away, either. 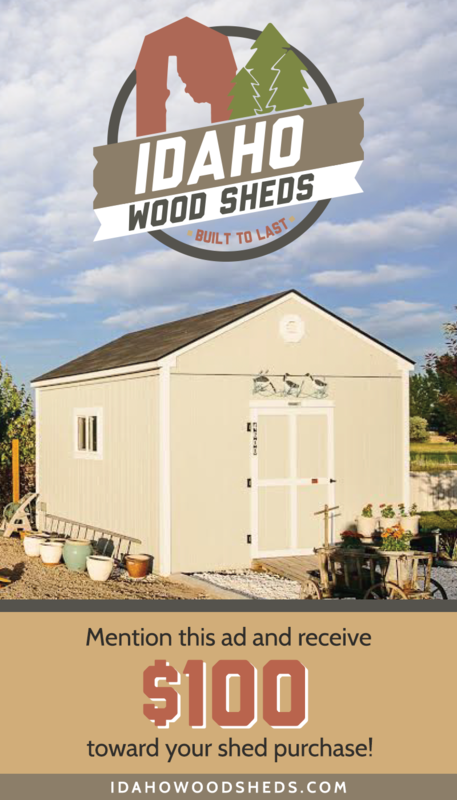 You might want to refer to it for various reasons during and after the season, such as checking how to know when to harvest or remembering a variety you want to plant again! 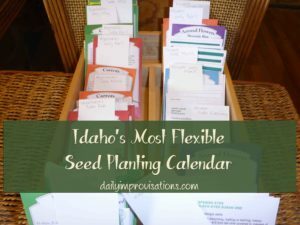 At anytime during the planting season, I can easily add another seed packet to the indexed planting schedule. Maybe I will see something in the store or a friend will mention something they are planting. There will still times when I am wandering around outside with seed packets in my pockets, but instead of odd piles accumulating because I had ideas of planting this or that on a given day, I can easily put those seeds back into my calendar slots and know I will be reminded of them later. In the past, I avoided putting them back in my general alphabetical seed storage, because I wanted to remember to plant them. As a result, I ended up with packets of seeds all over. The box I am using for this is a homemade gift from a friend, which alone makes it a treat. I also like the fact that it has a handle for easy carrying, dividers for sorting, and is a convenient size. I have seen maid’s baskets that have similar features. Are you ready to PLANT ALL THE THINGS! ?